If you take a stroll through Samsung’s CES 2018 booth, you’ll notice that the connecting thread linking the wide range of Samsung products and services showcased at this year’s event is “connection” itself. Yes, uniting Samsung’s industry-leading ecosystem of Internet of Things (IoT) offerings – which spans the company’s latest Family Hub refrigerators, TVs, and even its new Digital Cockpit vehicle-display interface – is SmartThings, Samsung’s open and powerful IoT platform designed to connect smart devices and simplify daily life. And offering users a simple, personalized platform to help them fully utilize this expansive IoT device network is Bixby, making it easy to manage these devices in ways that work for you. Bixby was introduced, in part, to address an issue that has limited IoT technologies’ widespread adoption: the perception that their interfaces are too complicated for users to comfortably take advantage of them. 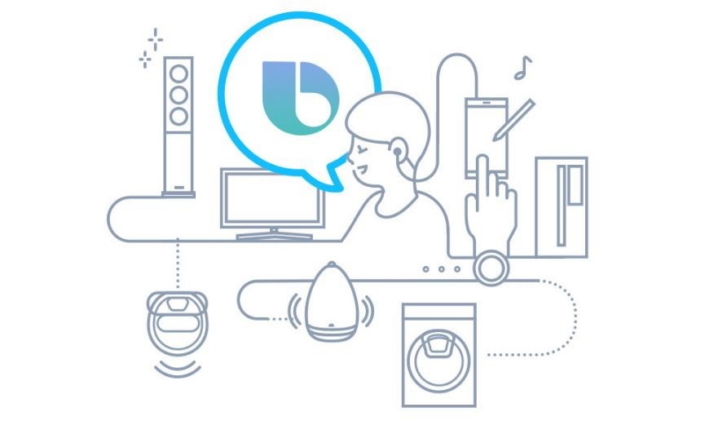 Bixby adds intelligence to Samsung devices connected to the SmartThings platform. Adding Bixby’s voice support to a wide range of household products will not only make them easier to use, but will also allow users to speak to Bixby on one device and command it to access and control multiple others. At this year’s CES, Samsung has pledged to integrate Bixby into all of its connected devices by 2020, with select 2018 Samsung Smart TVs and Family Hub refrigerators in 2018. This will ultimately allow more consumers to enjoy harmonized IoT experiences at home. Samsung has announced that beginning this year, select Samsung Smart TVs will be Bixby-enabled. Bixby’s command-driven interface creates a smarter and simpler approach to controlling your TV and other connected devices, and allows you to streamline how you access the information you need and enjoy your favorite content. For example, the interface lets you seamlessly transition viewing sessions between your Bixby-enabled smartphone and displays, so you can pick up right where you left off when you finish your commute or move to another room. And when a new episode of your favorite TV show is about to start, Bixby’s intelligence will allow it to automatically send a notification to your phone that, if tapped, will instantly command your Samsung Smart TV to tune in to the right channel. You can even ask Bixby to dim the lights and pull up one of your favorite films for movie night. In addition to streamlining entertainment, the TVs’ Bixby support allows users to reduce the number of steps required to carry out everyday tasks like preparing dinner – by commanding their TV to peek inside their Family Hub, for instance. Bixby integration has made Samsung’s powerful Family Hub refrigerators even more so. Unveiled at CES 2018, Samsung’s latest Family Hub refrigerators feature a variety of intelligent ways for users to manage their food, entertainment and IoT devices. Having Bixby in the mix allows for even more ways for families to keep their household connected and organized. For a start, the new Family Hub’s Bixby support and multiple voice recognition technology allow the refrigerators to provide individual family members with customized information based on their preferences. So, for instance, if a user asked Bixby “What’s new today?”, it would pull up a personalized morning brief that included their schedule for the day as well as news and weather from their preferred sources, and tell them how long it will take to get to the office. For those times when you can’t quite decide what to cook, Bixby will allow Family Hub to recommend a recipe for a delectable dish based on what you have in your fridge and in accordance with your dietary needs. You’ll also be able to command Family Hub to check on the status of compatible connected devices like your Samsung QuickDrive™ washing machine, and Bixby will let you know exactly how much time is left in your wash cycle. Samsung’s advancements in artificial intelligence and smart technologies are helping the company usher in an era of more open and connected IoT experiences. Integrating Bixby into more devices, and exploring ways to make more objects intelligent, will eventually allow more households to experience the benefits of a seamlessly connected IoT ecosystem. IoT interactions will be natural, and our smart devices will be so seamlessly woven into the fabric of our lives that we’ll spend less time managing them and more time enjoying our day.